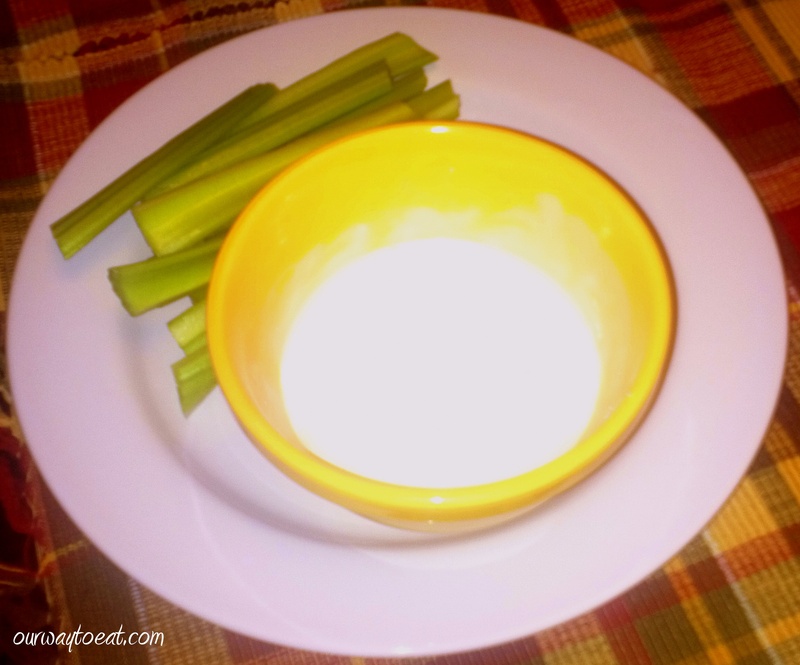 For the past month or two, I have been preparing a meal every Sunday that cooks all day in the Crock-Pot on Monday and welcomes us home for an easy, satisfying supper. 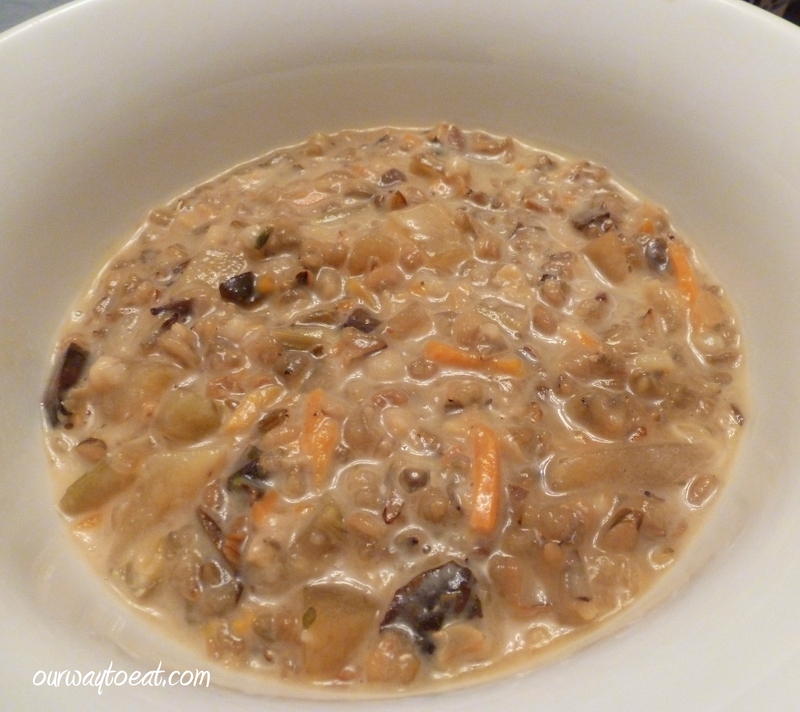 Earlier this week I made a delicious Wild Rice soup in our Crock-Pot. * I bought Wild Rice that was raised on the Red Lake Reservation, a community about 40 miles from where my parents live in northern Minnesota. 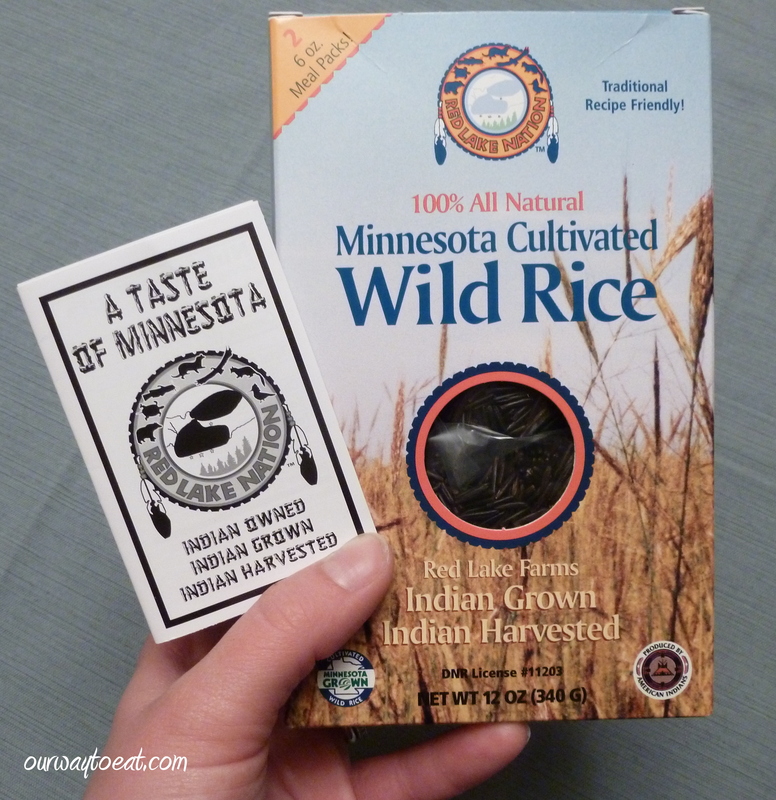 When I buy Wild Rice, I seek out rice raised on a reservation from that region, White Earth, Red Lake and Leech Lake Bands all harvest and sell wild rice. It is the very best wild rice, and I like knowing where it comes from, and supporting the local economy in these communities with the purchase. Before establishing a weekly Crock-Pot routine, we often arrived home on a Monday night tired, a little worn down from stress of the new work week and in no mood to cook. Nights like that, we often end up going out to eat. Sure, it is nice to be able to give ourselves a night off, but neither of us are thrilled about using part of our “dining” budget on a last-minute meal that we haven’t anticipated as a nice evening out. As much as I have been resistant to planning meals ahead in the past, I am tentatively starting to use forethought to my advantage. I am glad I didn’t know I would start doing this 6 years ago though. I think I would have been scared by the prospect of becoming a crazed Crock-Pot enthusiast, or at least would have hoped that the meal was served with a touch of irony. 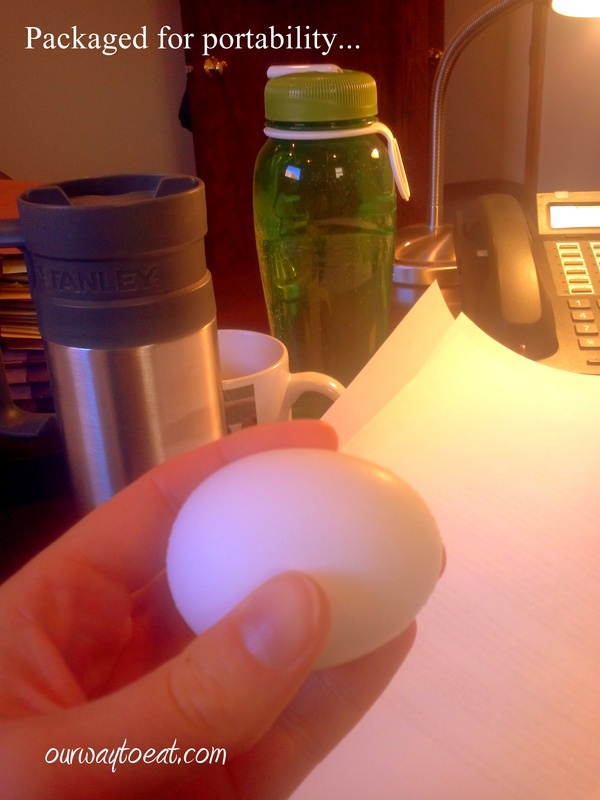 It turns out, at this point in my life, the routine is the opposite of scary, and there isn’t a hint of irony involved. Making a small effort to have a meal ready when I come home is breathing new life into Mondays! I leave for work in the morning feeling organized and like a real, functioning grown up. When the evening ahead crosses my mind throughout the day I look forward to being welcomed home by the scent of simmering soup seeping from the cracks of my old house as I approach the door. As I cross the threshold, I have little to do to enjoy a satisfying supper and a relaxing evening. To make this week’s soup, I chopped and measured all of the ingredients into the liner of our Crock-Pot on Sunday night, covered it, and placed it in the fridge. ½ Cup Brown Rice – not necessary, but it is cheaper, and adds additional texture to the soup. 2 Bay Leaves – remove before serving. A Splash of Skim Milk, Half and Half or Heavy Cream optional. You might notice that there is no oil or butter in my recipe. Some soup recipes call for sautéing the onion before putting it in the crock. I find that step to be unnecessary. With the long, slow cooking process, everything cooks thoroughly and all of the flavors blend well. As an added bonus, without sautéing any of the vegetables in butter or oil, calories are spared. Monday morning, I added the carton of broth, gave it a stir, and set the crock to cook on low heat for 8 hours. I am not sure if all slow cookers have this feature, but my crock switches to “Warm” when the programmed cooking time is done. 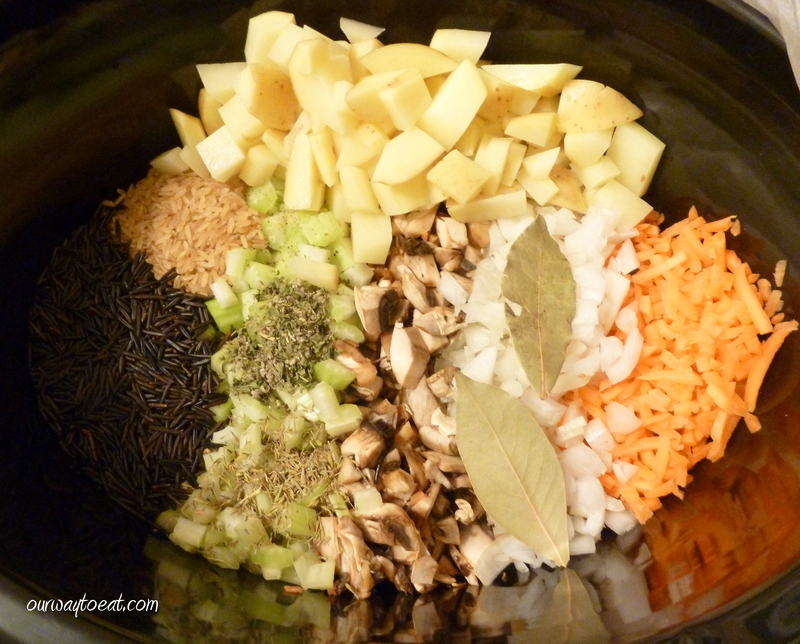 It works wonderfully to keep the soup warm, but not to continue to cook it longer than needed. 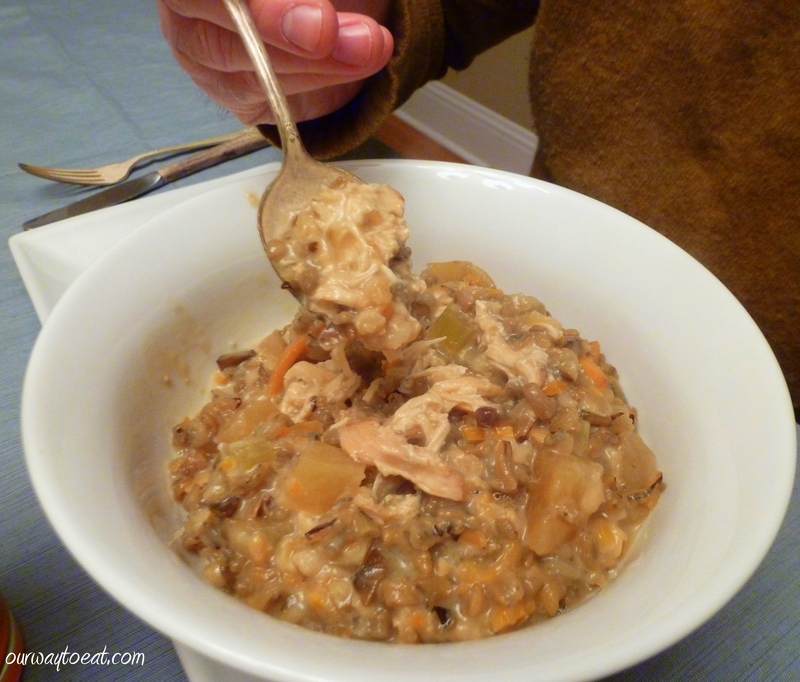 This recipe made a nice amount of soup for us for supper and leftovers for lunch. We don’t need more than two meals of soup, but there would be plenty of room in the crock to double the recipe to feed a larger group, or to freeze extra soup for a later date. If the entire crock of soup will be devoured the night it is first served, I might add just a touch more Tarragon and Poultry Seasoning, because seasoning was a bit faint on first night. We thought that the seasoning in the soup came together nicely when we reheated it for our lunches at work. 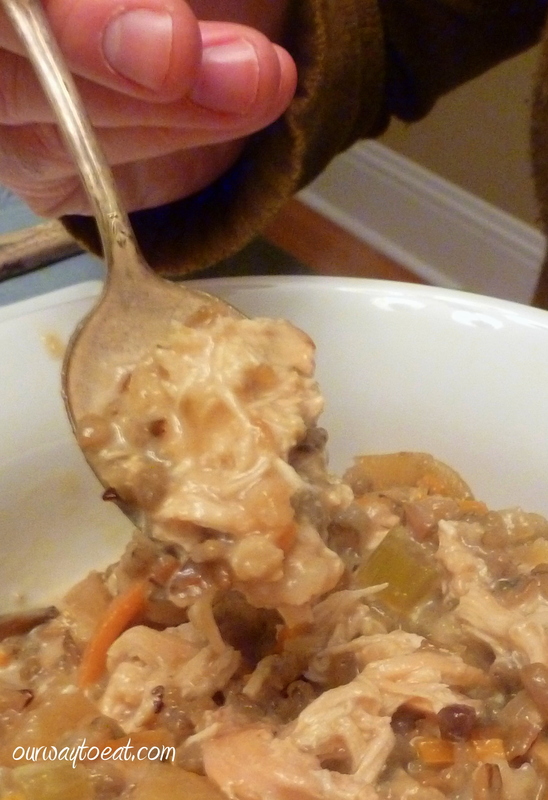 This is great soup to make in advance and reheat. If there are vegetarians in your house who are not strict about meat juices in their food,*** you could even cook the chicken breasts in the soup, take them out and then add chopped chicken to the bowls of only those who want it. If you want your soup to be strictly vegetarian, chicken can be cooked separately, and added to the bowls of those who want it, or not cooked at all, if no one is eating meat. There is a continuum upon which every vegetarian places themselves that ranges from unoffended by some exposure of their food to meat at the one end, to completely avoiding meat coming into contact with their food or having meat juices in their food at the other end of the continuum. You need to do what works for you and yours, and this recipe is easily adapted to accommodate varied diets. The only remaining step is optional. About ten minutes before serving you can stir in a splash of warmed milk, half and half or cream. The soup would be fine without it, but I really like having a little milk or cream in my soup. Tonight, we didn’t top our soup with anything, but some sliced almonds or sunflower seeds would be nice. I also like a little shredded cheddar on my wild rice soup upon occasion. Some people wouldn’t go near soup without a shot of spicy Rooster Sauce, or Sriracha for those who are less familiar with what has become the most popular condiment in the world. The soup is very hearty and satisfying on its own, so you don’t need much to round out the meal. A chunk of warm, crusty bread, with or without butter and cheese would be perfect. 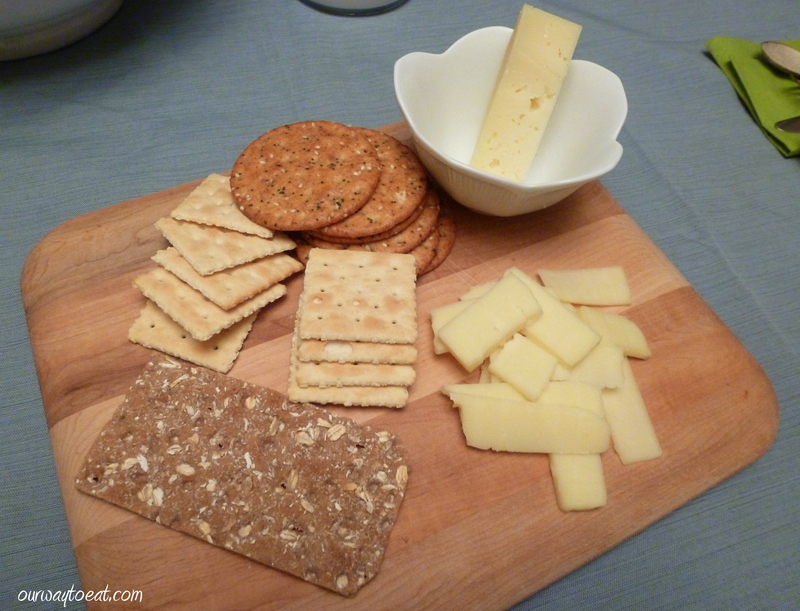 Tonight I pulled out a few crackers from the pantry, which I served with some sliced white cheddar and Asiago cheese. 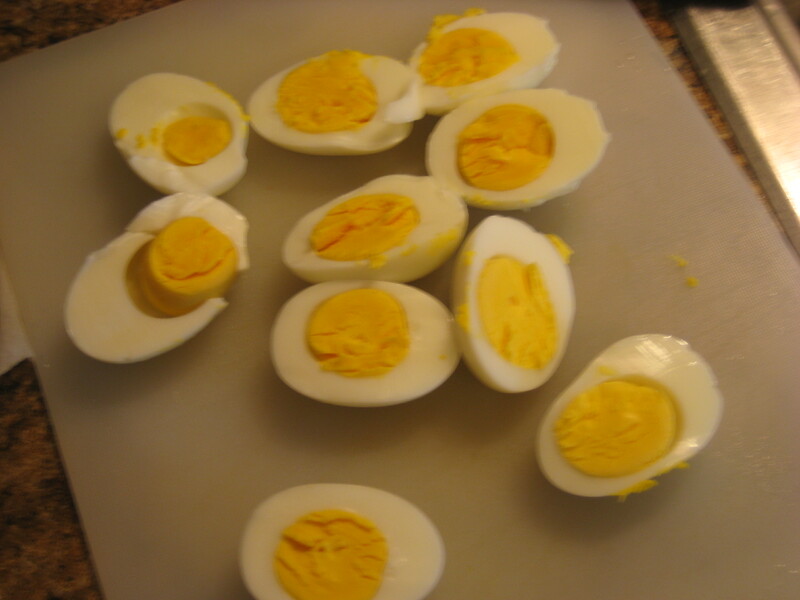 Growing up, my Mom always served egg salad along with soup or chili, so it is what I crave when we’re having soup for dinner, so of course, I made some. 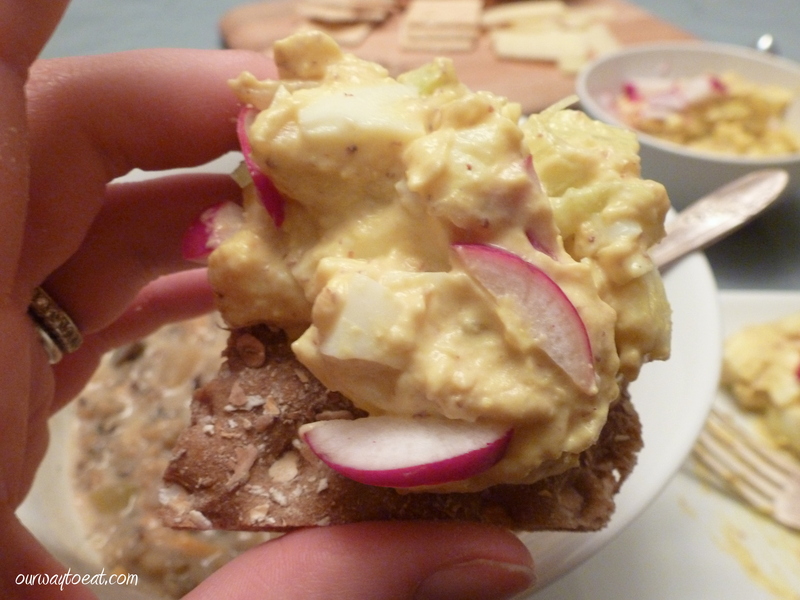 The egg salad was mostly made before I realized that we had no mayonnaise. I used Dijonnaise instead, and it turned out to be a surprisingly good substitution for regular mayo. Dijonnaise has the creaminess of mayo, and with the kick of Dijon mustard flavor, I swear that you cannot tell that it is fat-free. When life is busy and stressful, there are little things you can do for yourself and your family to provide warmth and calm. Coming home to delicious soup for supper that has simmered slowly in the Crock-Pot all day feeds the body and soul. 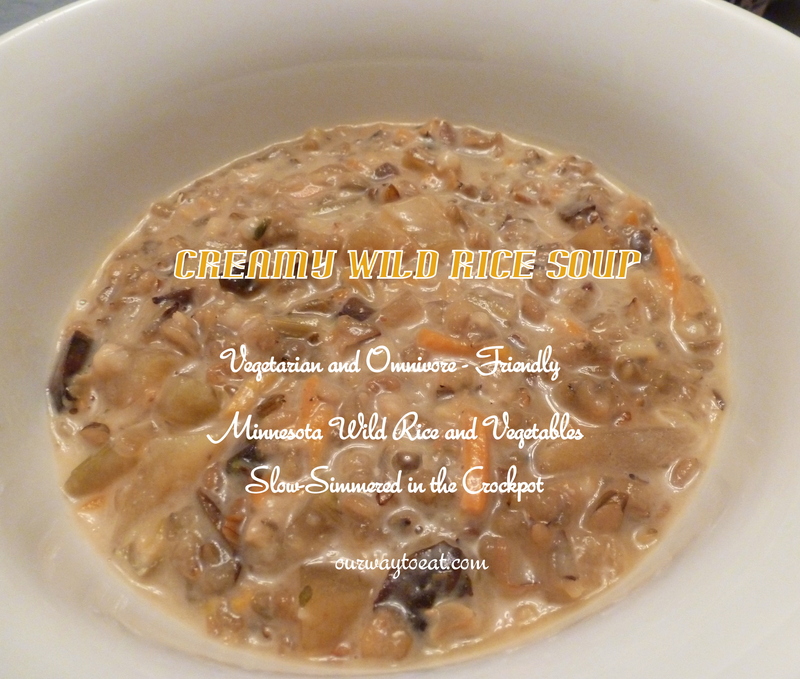 We loved this creamy, comforting soup full of vegetables and wild rice. I will make it again soon. *I apologize if trademark dilution offends you. My slow cooker just so happens to be a Crock-Pot. Words like Crock-Pot, Kleenex and Kraft Dinner are far too deeply embedded in my vocabulary to use their proper generic terminology, especially since I actually use these brands. **I can’t think of why I would make this soup solely for meat eaters. It is so good! I would want a bowl. Maybe if I made a separate crock of the meat-free version for a party. ***In my reference to vegetarians who are not strict about being meat-free, I might be politely referring to households with picky children. What do you do when you are hungry for a snack and you have a fresh baguette and all of the ingredients for the two perfect summer salads to go with it? 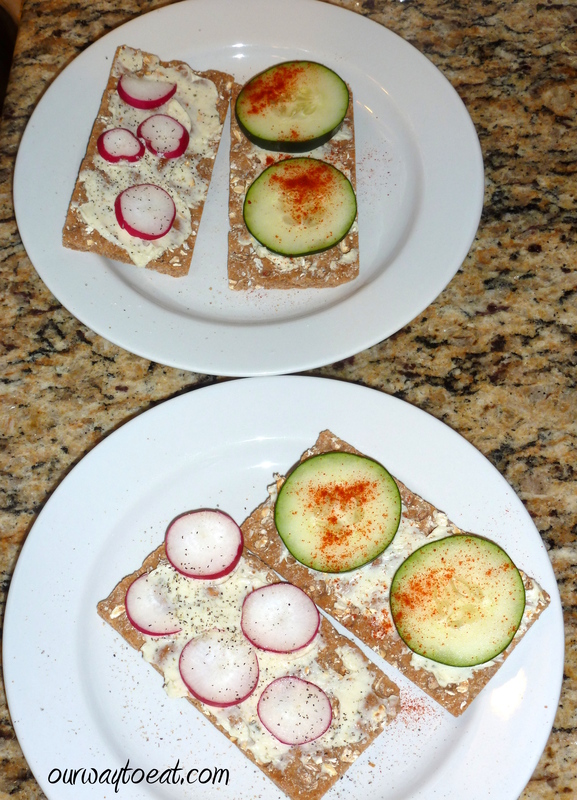 Well if you are almost incapable of avoiding complication in the creation of even the simplest of summer snacks (like me), you make both. 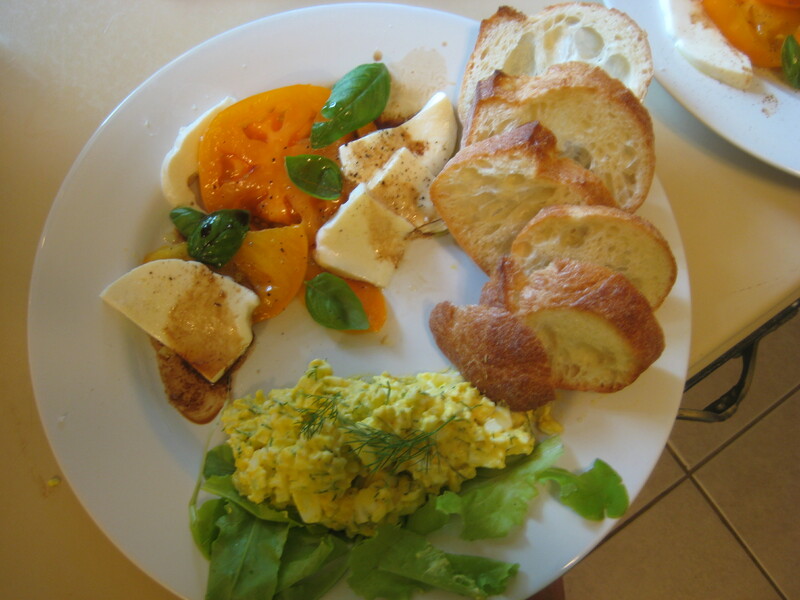 Today’s summer afternoon snack started with a caprese. I think an insalata caprese would be in the top 3 contenders of foods that I’d want to have to eat on a desert island. I love them so much that when our garden is kicking out tomatoes and basil like mad, I’m eating them in as many as three meals a day. They are summer’s loveliest flavour and texture combination. A luscious tomato, cut thick, with generous slices of fresh mozzarella and just-picked basil leaves floated down upon them; finished with the lightest drizzle of balsamic vinegar and olive oil, salt and maybe a little pepper. I’m no stickler, but I will mention that these things taste like a million bucks if you’ve grown your own tomatoes and basil, or bought them very fresh from friendly farmer who has. And the mozzarella-it must be very fresh, milky and on the watery and porous side. I think the cryo-packed balls can often be as good as the packed-in-water in plastic containers from the grocery store. So many people love good fresh mozzarella that it is becoming very easy to find and cheap to buy. Enough about my caprese obsession. 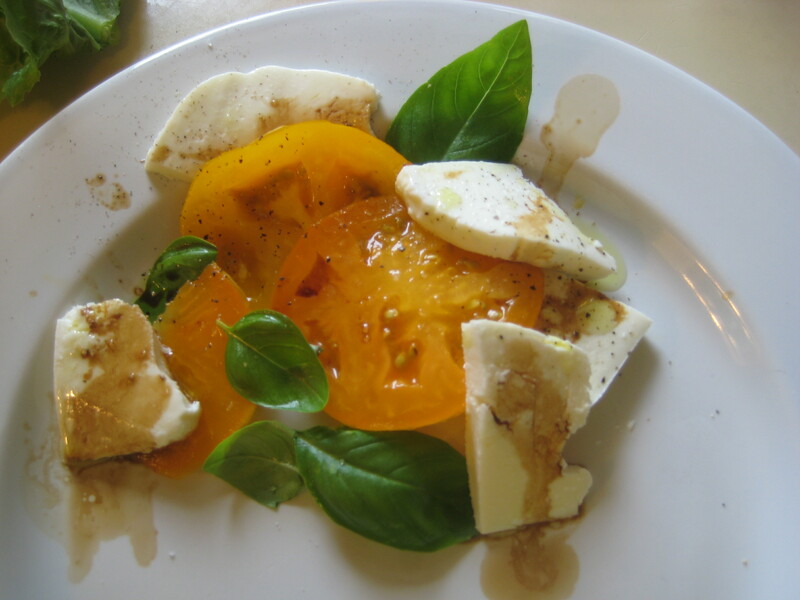 How about a picture of the golden tomato caprese that launched a thousand word paragraph? 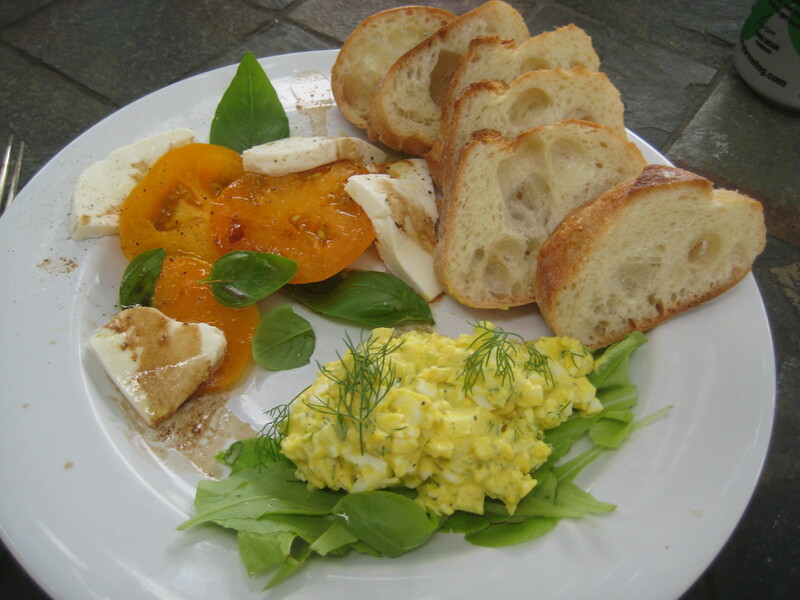 This on its own is the perfect summer snack, but there are two hungry people in this house, and, I’ve also got some lovely dill, fresh eggs and lettuce, so I can’t stop with just the caprese. 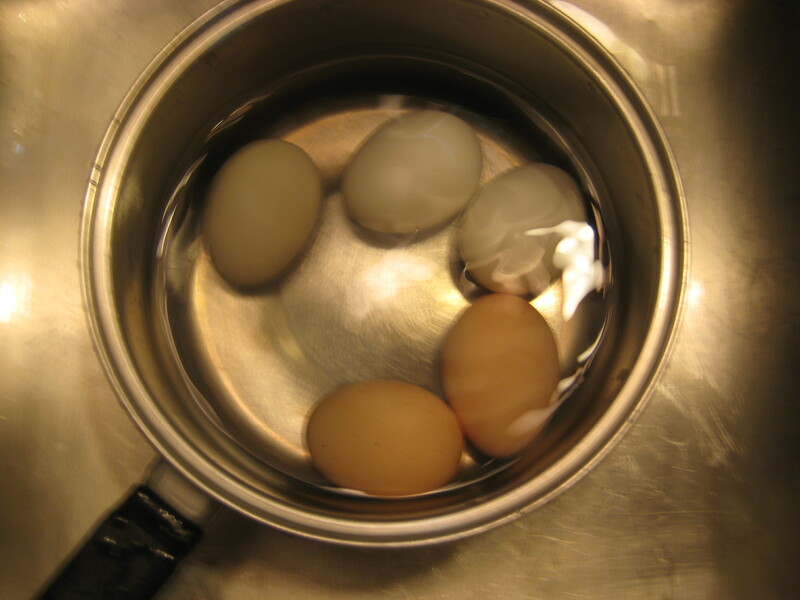 I boiled the eggs, or, if you are a student of Martha Stewart –hard cooked them. 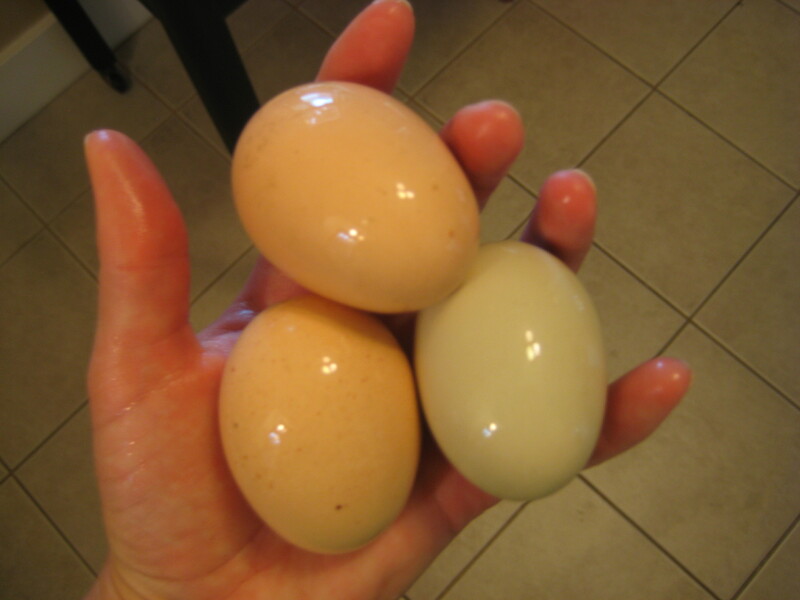 Check out these gorgeous fresh eggs that I bought from a man named Fernando who raises them in the little town where I work. 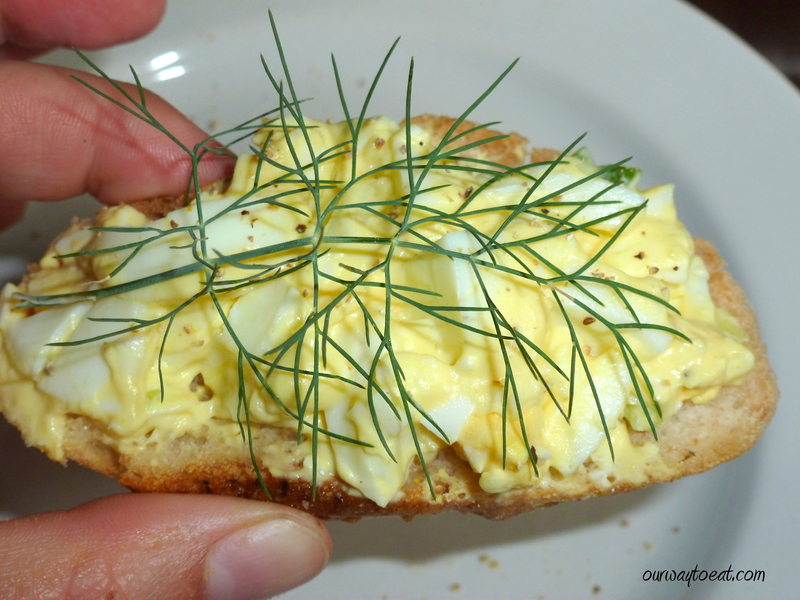 For egg salad, eggs are boiled, peeled, sliced in half and ready to be chopped and combined with a little light mayonnaise, mustard, diced onion and celery and a little pepper and salt to taste, then piled on top of some lettuce and garnished with dill, both from the garden. There isn’t much more to do then to place the plate between two hungry people to eat with baguette, or on their own. I put salt and pepper, olive oil and vinegar on the table, to adjust flavours, as needed. We dove in. 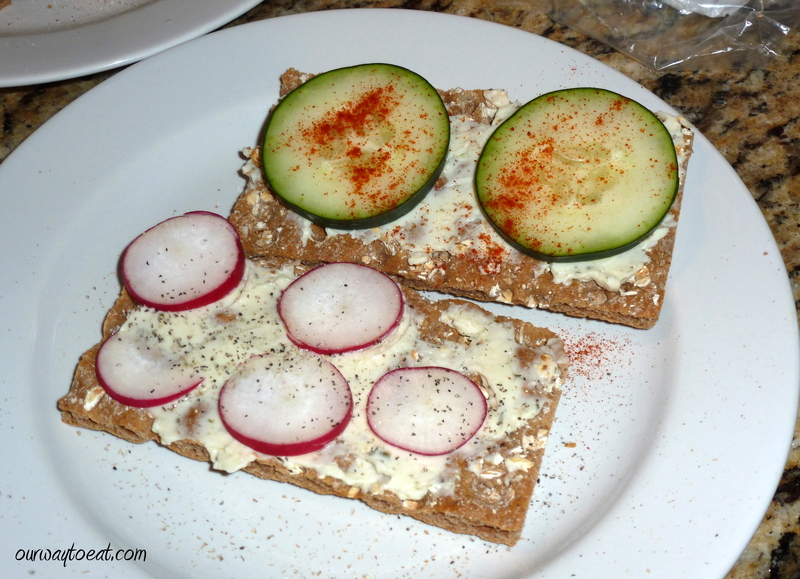 It was fresh, flavourful and satisfying; the perfect summer snack.